and across Sydney to keep your air conditioner working at its best. We'll arrange regular appointments at convenient times to inspect, clean and service your whole air conditioning system. Our experienced technicians will make sure it's operating at peak efficiency and catch any problems when they're easy to fix, before they become more serious. 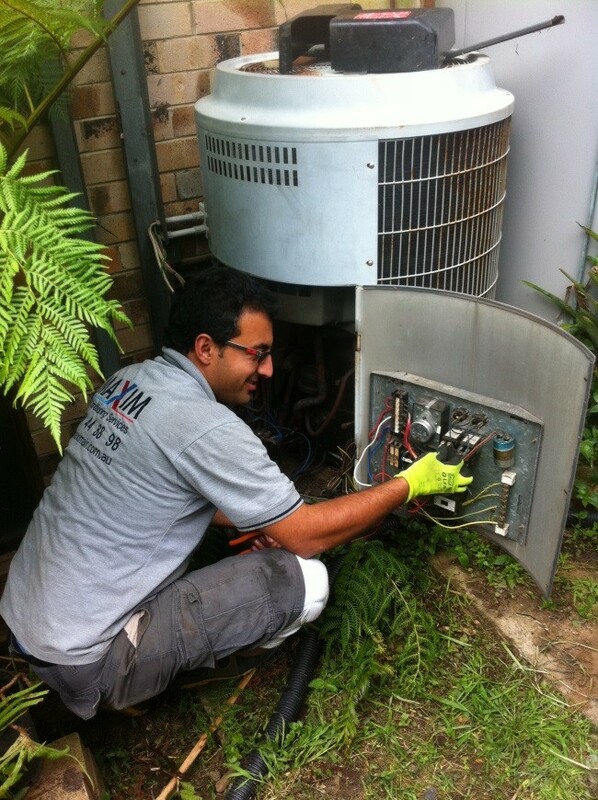 If you have a problem with your system, contact Maxim Air for air conditioner services and emergency repairs in Hills District, North Shore and all Sydney metropolitan areas. Even if you don't notice anything wrong with your A/C unit, it's still a good idea to have it checked out by professionals at least once a year – especially when the summer's approaching. Air conditioning repairs are in high demand when the temperature heats up, and you won't be left sweating when you schedule an inspection ahead of time. Regular cleaning and servicing means problems are less likely to develop, so you won't be stuck without cooling or heating when you need it most. Without routine maintenance, your air conditioner will steadily lose efficiency and performance over time. It will cost more energy to cool your home and you might find it more difficult to maintain the temperatures you want. Carry out these basic checks and cleans every month during the cooling season to improve the chances of your A/C system running smoothly. Dirty filters reduce performance by up to 15% and increase energy costs. If you don't change your filter for a long period, this could cause serious damage to the evaporator and other components. Aim to clean or replace your filter every month when the system's in use. If your house has a lot of dust or you have pets who shed fur, you may need to change the filter more frequently. Filters prevent most dust and dirt from getting into the system, but some will still get through over time. This impairs the efficiency of the evaporator and condenser coils, as they can't absorb as much heat. These coils should be cleaned once a year, ideally by a professional, or more often if they're exposed to dust and dirt in their surroundings. Dirt can also collect on the aluminium fins on evaporator and condenser coils over time. The fins can also move or get bent out of shape. They should be cleaned and moved back into their original position to restore normal performance. Outdoor condenser units should be kept free from dirt, dust and foliage. Sweep away leaves and other debris and cut grass, bushes and other plants back to at least one metre, to make sure airflow isn't restricted. These units are designed to be outdoors in all weather conditions, so they should never be covered. Don't wait until the summer to check that your system's working properly. Switch it on in the spring and let it run for an hour, so you'll have the chance to spot anything unusual that needs to be dealt with before the heat arrives. Basic cleaning and maintenance can be done DIY, but for more complex or potentially hazardous tasks, you need to call in the experts. Some air conditioning services can only be carried out by a licensed technician. Getting your units checked out by the professionals saves you money in the long term. When your air conditioner's operating at peak efficiency, you'll enjoy lower electricity bills and the components will last longer, so you won't have to replace the system before its time. Does your air conditioner need a tune up? Get in touch with Maxim Air and we'll schedule a visit from our qualified technicians at a time that's good for you.